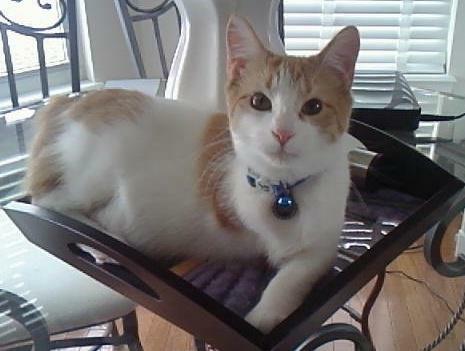 This post is the final in the Adopt A Less-Adoptable Pet Week Blog Marathon. You can read the previous post at Sebastian's blog, seabasscat.com. 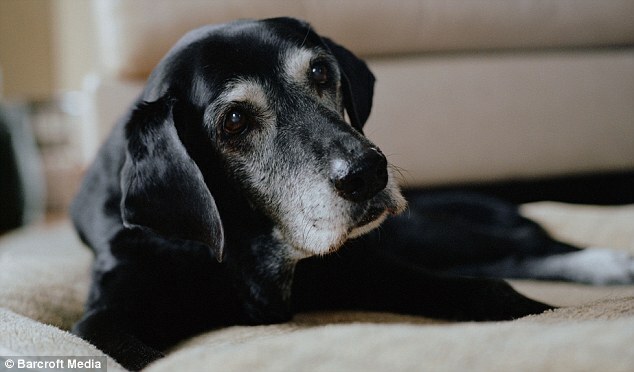 Why do people shy away from embracing the love of a pet who may be less than perfect? On the surface, 'less than perfect' seems obvious: there are animals missing an eye, three-legged animals, deaf or diabetic ones. I understand concerns about vet bills that add up, or a concern that one's environment might not be a safe one for such a pet (for instance, my home would be far too dangerous for a completely blind pet because of its open layout and the potential hazards that presents). But I would argue those reasons aren't as clear-cut as you might think. 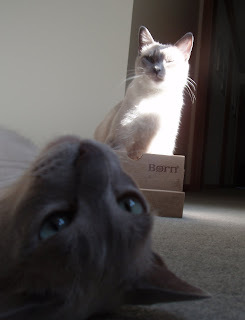 Consider this: the same people who would shy away from an FIV-positive cat are often the same ones who wouldn't think twice about adopting a seemingly hale and hearty - and currently the most popular - breed of cat: the Siamese. 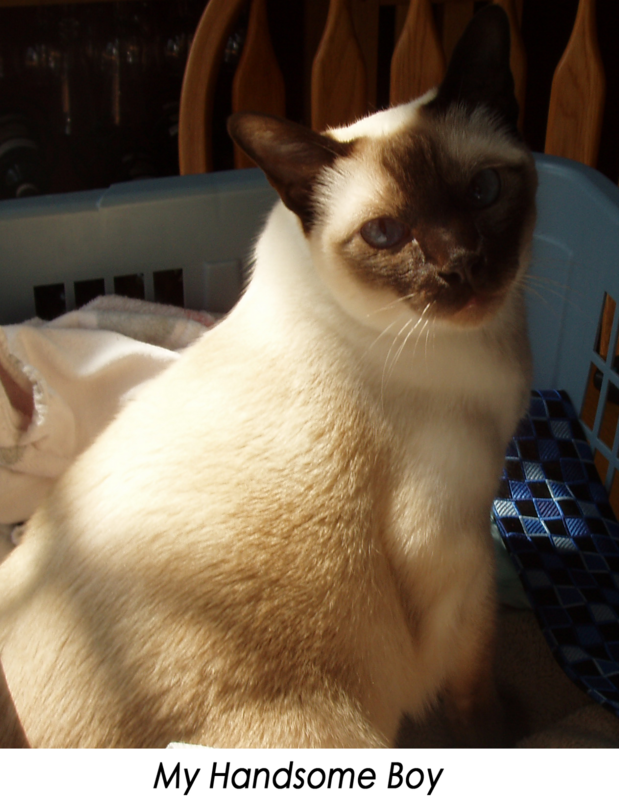 But did you know that the Siamese is known to have the highest number of genetically linked diseases? For example, Siamese cats are three times more likely to develop cancer of the intestine than any other breed. The same goes for dogs. A current favorite, the English Bulldog, is fraught with health problems. 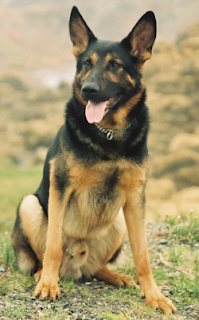 And then there is hip dysplasia, common with both German Shepherds and Labrador retrievers, as well as the problem of cataracts in poodles. You get the picture. So for those of you reading this who may volunteer at a shelter, or who may have a friend or relative considering the addition of a furry family member, I urge you to suggest a less-adoptable animal. If they're looking for perfection, there are no guarantees. 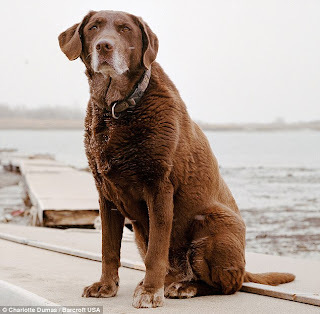 And they'll be missing out on an opportunity not only to find a loving forever friend, but oftentimes the rewards that come from owning a 'less than perfect' animal are – with a nod to the MasterCard ads – priceless. Today's post is written by a guest blogger who needs no introduction: Amy Palmer. She's a "cat whisperer" over at Wayside Waifs - and is also famous for taking Sebastian's dictation down for him at www.seabasscat.com (she's his Mom!). This post is #16 in a series. You can read post #15 on Sebastian The Sensitive Soul's blog. 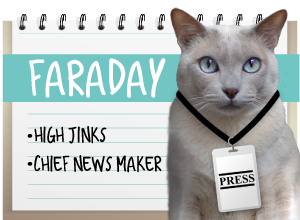 If you have read Gwen Cooper's “Homer's Odyssey”, you know that even if a cat doesn't have eyes, he can still be fearless. Homer once scared off a burglar! He doesn't need vision to be a fully-abled cat. If Homer can live a normal life without any eyes, having one eye is a piece of cake for Stan! Stan is an 8 year old, domestic medium hair cat with a gorgeous white coat who is available for adoption at Wayside Waifs. And he happens to be missing an eye. Big deal. He looks a little different but he doesn't let it bother him. He knows he's a handsome fellow! And how about Coolio? She doesn't let a little vision problem keep her down! She's playful and full of energy. Her right eye appears a little cloudy, but otherwise she looks pretty normal. She had a previous eye problem that caused her iris and cornea to fuse, causing permanent limited vision in that eye. All of these cats are considered “less adoptable” but in reality they are no less adoptable than a fully sighted cat-they just look different. Sometimes a cat with sight issues will need special eye care, but in the case of a missing eye, no medical care is needed. It's just like owning any other cat. 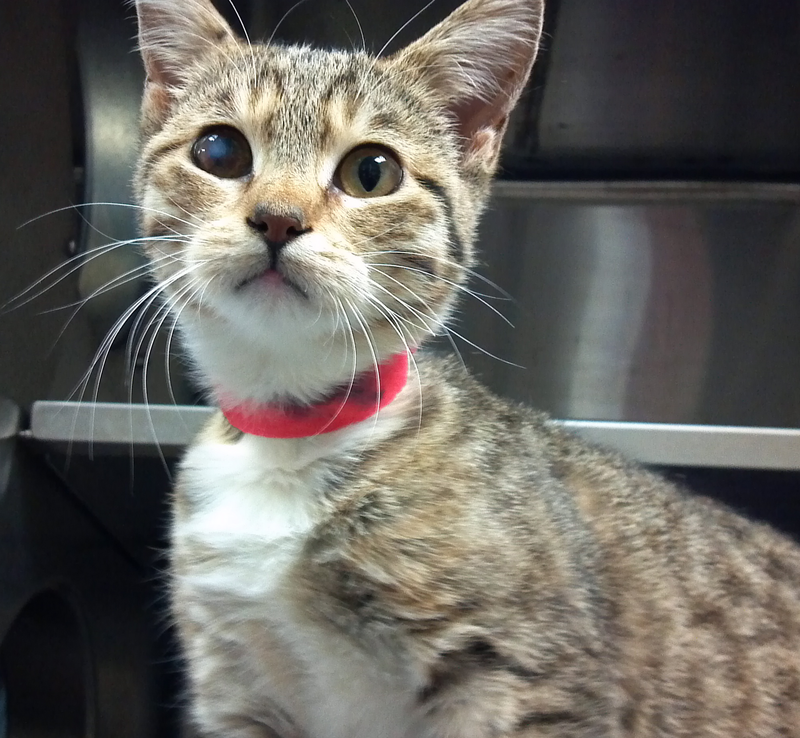 There are some tips that will make life easier for a blind or sight-disabled cat. First, if a cat has partial vision, try not to approach on the cat's blind side. 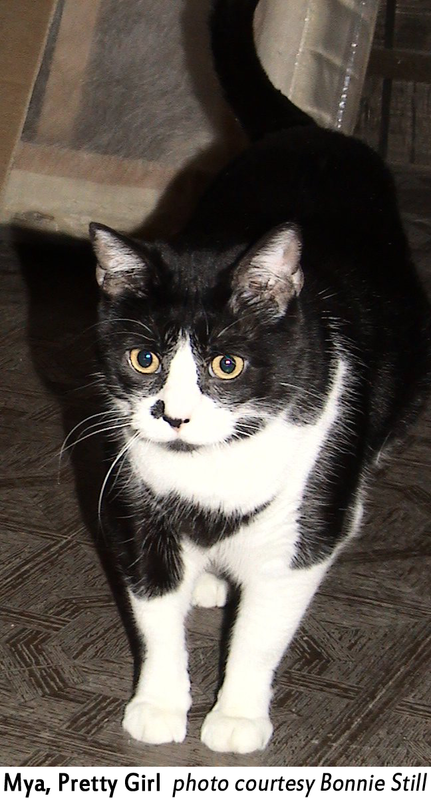 If the cat is completely blind, try saying the cat's name before touching him so you don't startle him and he can orient himself to your position. As far as the cat's living conditions, an open layout home will be more difficult for a sight-disabled cat to navigate. Walls and doorways give a blind cat a way to orient himself in his surroundings. Also, it's best to not rearrange furniture. Doing so can confuse a blind cat. That goes for the cat's items as well: keep his bed, bowls, litter box and scratching post in the same location. 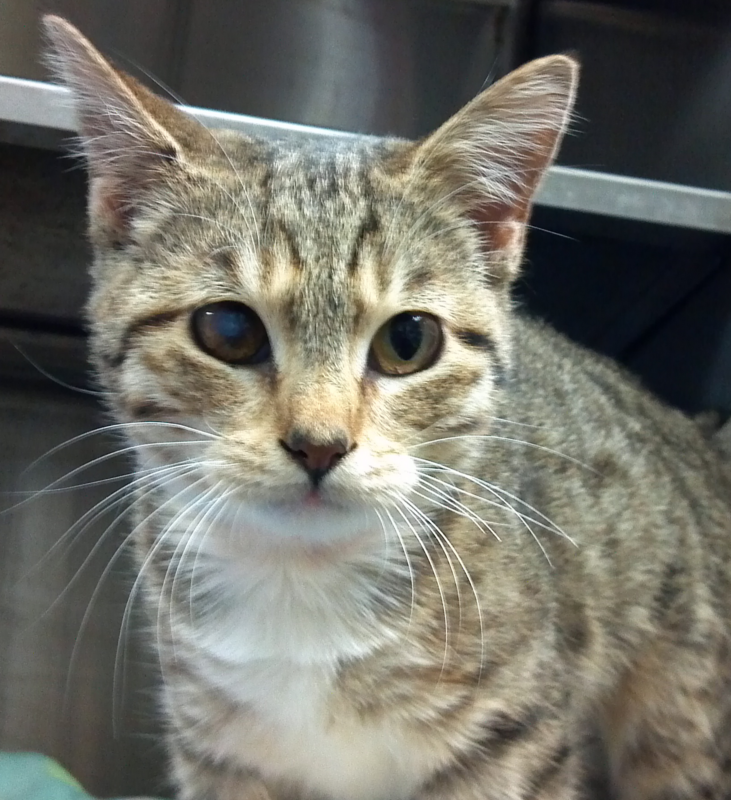 When you are first introducing a sight-disabled cat to your home, start slowly. Let him get acquainted with just one room first. You can expand his world as he gets comfortable. 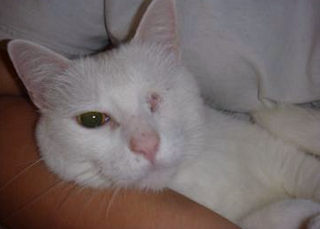 Sight disabled cats can be the result of many issues: injury, infection, tumor, or simply age. There is no reason to think that a cat can't deal with it though-cats are very adaptable! Other senses heighten to make up for the loss of the other, plus, those whiskers work wonders with navigation. Don't let a missing eye cause you to miss out on a great new friend! This post is #14 in a series. You can read post #13 at Sebastian The Sensitive Soul's blog. Where do I begin? With Cloudy, I think. 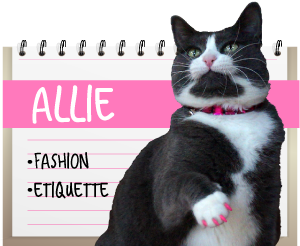 As much as this post is about Feline Leukemia (FeLV), it's also about her. Because, truth be told, I fell in love when I saw her. Cloudy was found in a very busy (dangerous!) part of Kansas City back in June. She was about a month and a half old at the time. Not long after she arrived at Wayside Waifs one of the foster volunteers, Mary Montgomery, saw her… and like me, it was love at first sight. 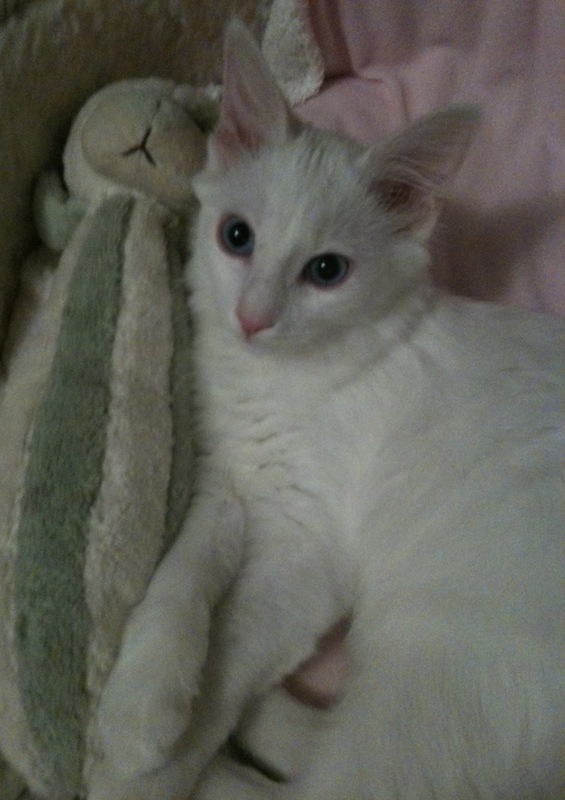 Cloudy went home with Mary, and as the days progressed, Mary began to notice that she might be deaf – no surprise, as most blue-eyed white cats (over 70%) are deaf. So Mary began teaching Cloudy to understand basic sign language, things like "come," "eat," and "no" (how's that last one coming along, Mary? *wink*). If you'd like to know what it's like to adopt a deaf cat, you can read about it here. 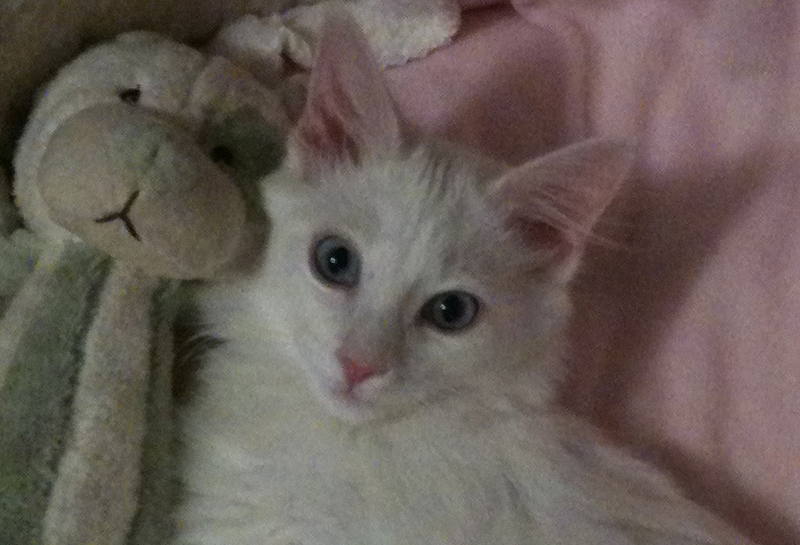 Mary was told when she took Cloudy that she had tested with a "weak positive" for feline leukemia. But since many kittens receive these antibodies from their mother while nursing, it's hoped that a well-cared for, healthy kitten might be able to clear the virus from her body. 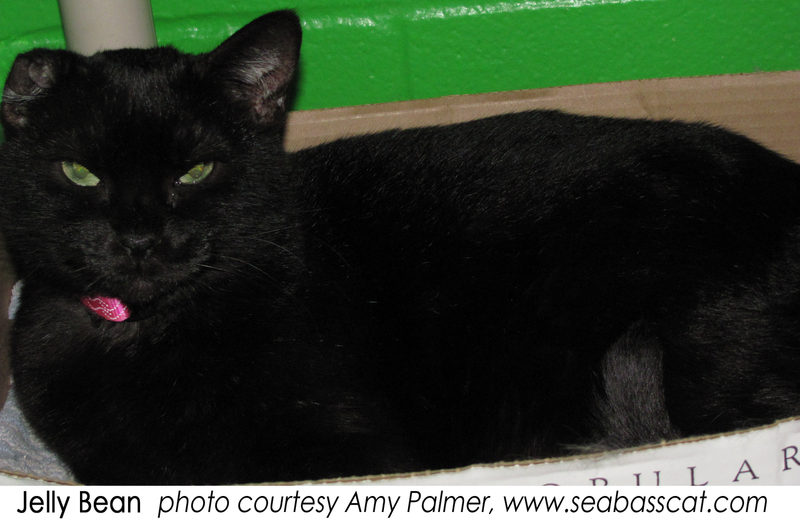 What is feline leukemia, and does it make a cat less adoptable? The answer to the second question is a resounding YES. FeLV is contagious, so if you are already a cat owner, a FeLV kitty is not for you. Cats can transfer the virus to other cats through bites, mutual grooming and sometimes by sharing litter boxes or feeding dishes. But only to cats; dogs and humans can't catch FeLV. 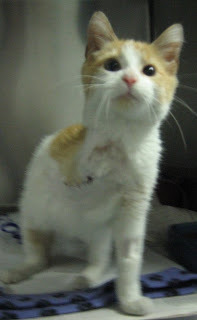 Feline leukemia is the most common cause of cancer in cats and it can lead to severe immune deficiency, suppressing a cat's ability to fight off an infection on her own. It's impossible to predict the life expectancy of a FeLV-infected kitty, but most don't live more than two or three years before they come down with an illness they just can't throw off. The best thing you can do is stack the deck in their favor: Feed them the absolute best diet you can. Avoid giving them uncooked food or unpasteurized dairy to eliminate food-borne bacterial or parasitic infections. Schedule exams at least twice a year, and make sure your vet pays special attention to gums, eyes, skin and lymph nodes. Watch her weight! Weight loss is often the first sign of illness. It's going to take a very special person to adopt Cloudy. Because, you see, she was retested. And she was unable to fight off the FeLV infection. So her time on this earth is limited. Mary and I can't take her because we have cats of our own and it would be criminally irresponsible to expose them to this disease. But there has to be someone out there – someone with a big heart and a lot of love to give. Someone who will do as Mary and I have, take one look at Cloudy and fall madly in love. When Mary shared Cloudy's story with me, something she said struck home: with cats like these, it's the quality of life not the quantity that counts. Because Cloudy has FeLV, people will pass her by. And they will miss out on an incredible opportunity: to give the priceless gift of love, and understanding, and a home. The gratification they'll experience, and the love she'll give them in return – beyond measure. Signing off now. My heart is breaking. Oh please…someone give our precious girl a home so she can die knowing she was loved…. If not adopt, then would you consider fostering? To give Cloudy the very best possible chance of survival, we're looking for a home with no pets at all...to decrease the chances of Cloudy catching anything from another animal. So if you have any questions about Cloudy or any of the other special needs kitties, or are interesting in adopting...feel free to send us an email! Today's blog is written by guest blogger, Jeane Ann Baumgartner. This is Tigger's story. This is her story, too. Enjoy...and have a tissue handy! This post is #12 in a series. You can read post #1 at Sebastian's blog, www.seabasscat.com. 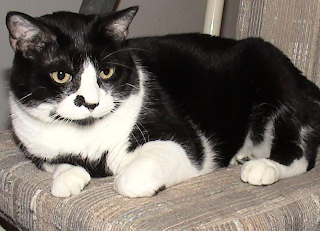 Two weeks had gone by since we had lost our cat Junior. The house was sad and empty and I couldn't stand being home. We started our search for a new male kitten less than 48 hours after our loss. My husband patiently took me from shelter to shelter but I wasn't making that connection. I wasn't ready. My Dad called me one evening to let me know there was a kitten in the Kansas City Star that needed adoption. My Mom had been worrying about his chances all day because he only had three legs. I immediately felt an obligation to this cat. How could I not rescue the crippled cat? 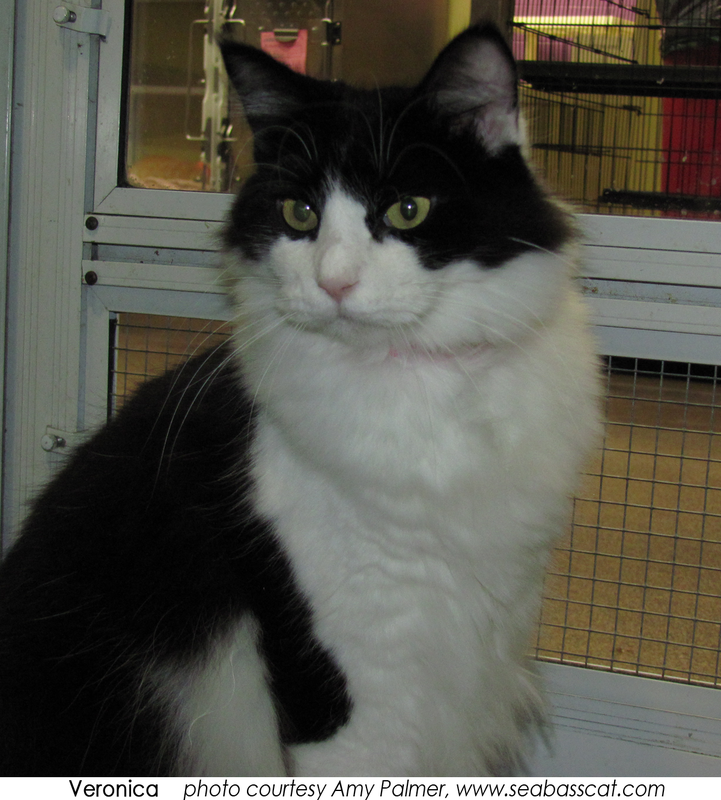 I looked up the shelter's website and was instantly disappointed because the first cat I pulled up was the one I wanted. 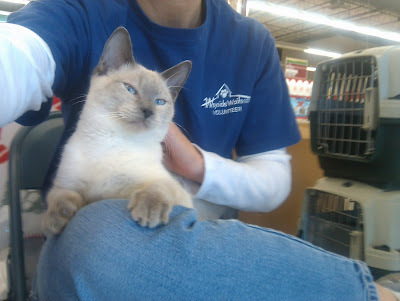 I had found our next family member and I couldn't have him because I needed to save the kitty with the missing leg. I looked closer at the sweet face and saw some black stitches where a front leg should be. This WAS the crippled kitty. I read that he was a Manx. A Manx is a wonderful breed and that meant that he was missing more than a leg, he was missing a tail as well. My husband and I went into planning mode before we went to meet him the next day. We prepared our guest bathroom where we would keep him the first few nights. We devised a plan for ramps to be built along the wall of our stairs. My husband would have built anything on those steps to make me smile again. I was taking the loss of Junior hard. I look back on that night now and laugh. One of the first things Tigger did when we brought him home was hop down those stairs. Ramps not included. Tigger pretty much hops wherever he likes. As a younger cat he would get himself in trouble by getting up where he couldn't get down. We've installed our "Save the Leg" Campaign all over our home. Losing a front leg is the hardest for a four legged animal to overcome because it affects their balance. Our campaign generally consists of some doggy stairs and foot rests placed throughout the house so he can get down from places without a crash landing. Tigger prefers a food bowl where he can rest his stump while he eats. When we put him down we place back feet first. He needs a little extra help bathing. His feline brother and sister help him with the right side of his face and some personal areas that need extra attention. Pet wipes handle the rest. Tripods have to keep their weight in check so we offered up a baby brother to help him exercise and I keep an eye on his food intake. What strikes me most often is that I forget his disability unless he is hamming up his Tiny Tim impression. Adopting Tigger has shown me that good can come from bad. We have a deal. He doesn't have to be glad he lost his leg, and I don't have to be glad we lost Junior. Without both events we wouldn't have found each other. I can't imagine my life now without this joyful creature. I hope you can offer an animal with special needs a home. My wish is that you forget their disability as well and focus on what they add to your life, not what they have lost. 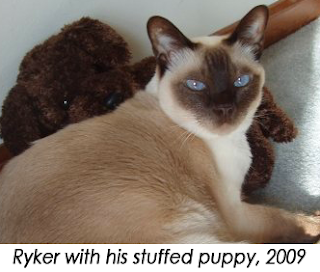 Guest blogger Bonnie Still, one of Wayside Waifs' fantastic staffers, agreed to take Mya's dictation for this story. Many thanks, Bonnie! This is post # 8 in a series. 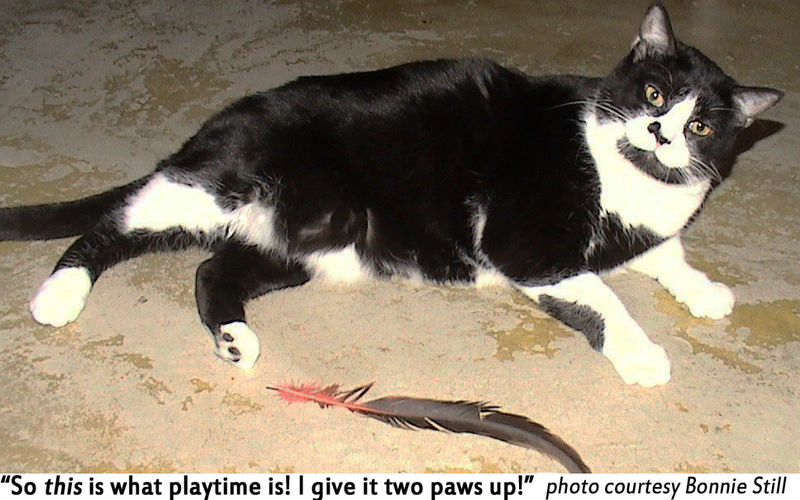 To read post #7, you can visit Sebastian's blog at www.seabasscat.com. Meow, my name is Mya. I'm a 6 yr old gorgeous female Tuxedo with big beautiful eyes. I was just recently adopted and wanted to tell you my story. Now, you may be wondering why such a beautiful feline such as myself would be considered "less adoptable". Well, I'm 6 yrs old. To a lot of people, I'm old. The other reason was because of my behavior when I had to stay at Wayside Waifs. You see, a year ago, last August, my owner died. Family took me in, but one of them turned out to be allergic. 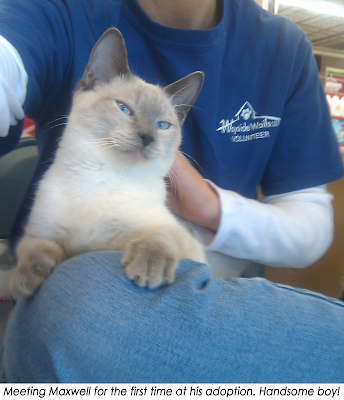 So, they surrendered me to Wayside Waifs. In the beginning, I was very sweet and friendly, everyone could pet me and I enjoyed their company. By the time I was moved to the adoption floor, I got sick - an Upper Respiratory Virus, which is common in shelters and often caused by stress. Staff and volunteers started to notice how unhappy I felt. Those that could interact with me, stopped. It wasn't because they didn't want to be with me, they just weren't sure about my behavior. I was getting swatty towards them because I thought they were going to give me more of that icky medicine. I was stressed, and wanted to go home. I didn't like the other cats, I didn't like the noise, I didn't like that when people came to see me that they would leave without me. Finally, 9 months later, I was adopted! I was so happy! But, it was not meant to be, and I was returned. When I came back, one of the staff members was very concerned for me. She had hated to see me decline for 9 months, and didn't want me to go through it again. So she fostered me until I was adopted. This was fairly new for the shelter! That meant I was even more of a challenge to get adopted because I was only on their Website. My foster Mom really helped me to be my true self and to relax - I even enjoyed bellyrubs! I was 6 yrs old and had no idea what to do with a toy, but I learned, and then all I wanted to do was play. There was no stress, just a warm, quiet place to stay with my new friend who took very good care of me. But, guess what? After nearly 3 months with my foster mom, I was adopted to a wonderful family who really understood me, and wanted to give me a good home. My fave spot is on their bed, it's so comfy! We are still learning about each other, but of all the cats needing a home, they wanted ME. That made me feel very special and loved. They believe every cat deserves a home, even one that can be cranky. Thank you to everyone that took good care of me, I will never forget you. This post is #6 in a series. 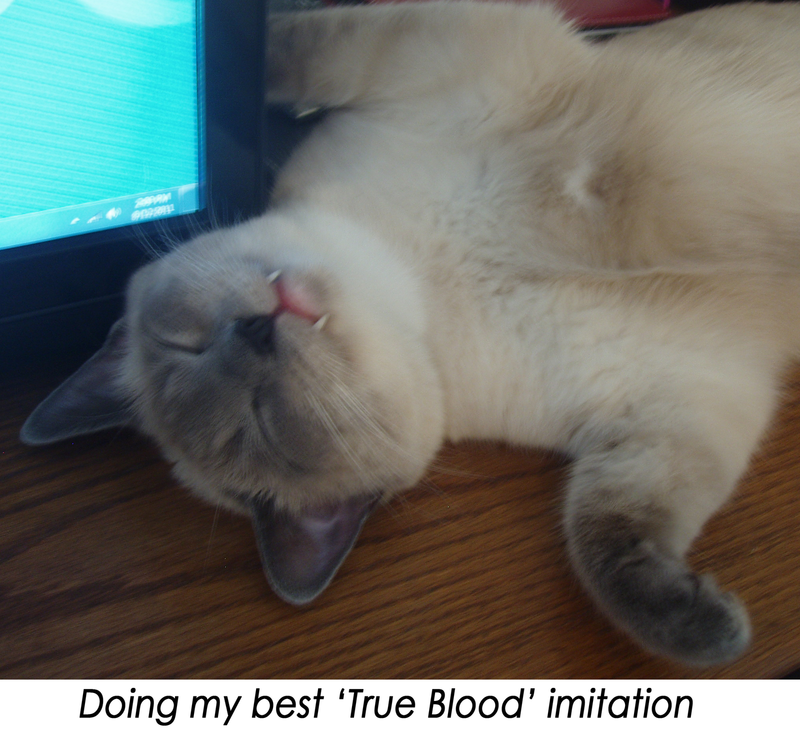 To read post #5, go to Sebastian's blog, www. seabasscat.com. I'm sometimes asked "what's it like to live with a deaf cat?" My favorite answer comes from another deaf cat owner, who replied, "It's no different, really. I yell 'no!' and he ignores me just like the others do." 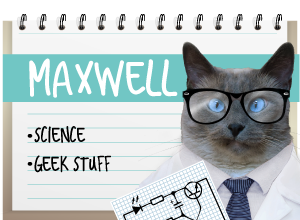 We noticed Maxwell was deaf on his first day with us when he failed to react in any way to the vacuum cleaner. As a test, my husband slowly advanced the machine right up to his nose, where he curiously sniffed it and turned away. The vet confirmed it the next day. 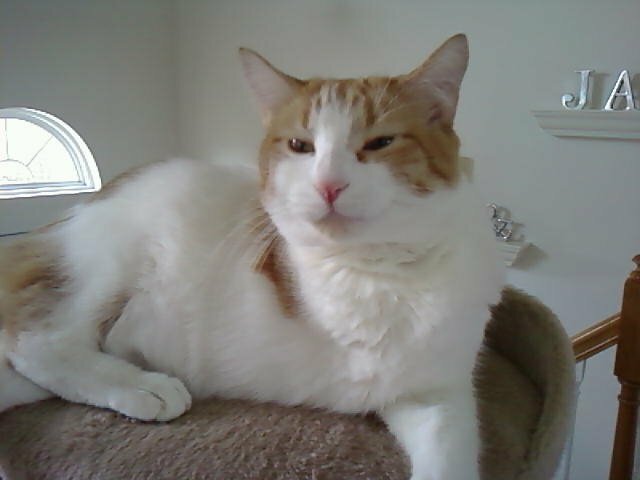 Those first months were especially hard on me, as I had to be the 'bad guy,' administering those hated ear drops - two different meds - twice a day. I was also the one who took him to countless vet visits, and ultimately his surgery. I worried this would affect our ability to bond and that he'd associate me with nothing but unpleasantness (I'm so glad that didn't happen!). 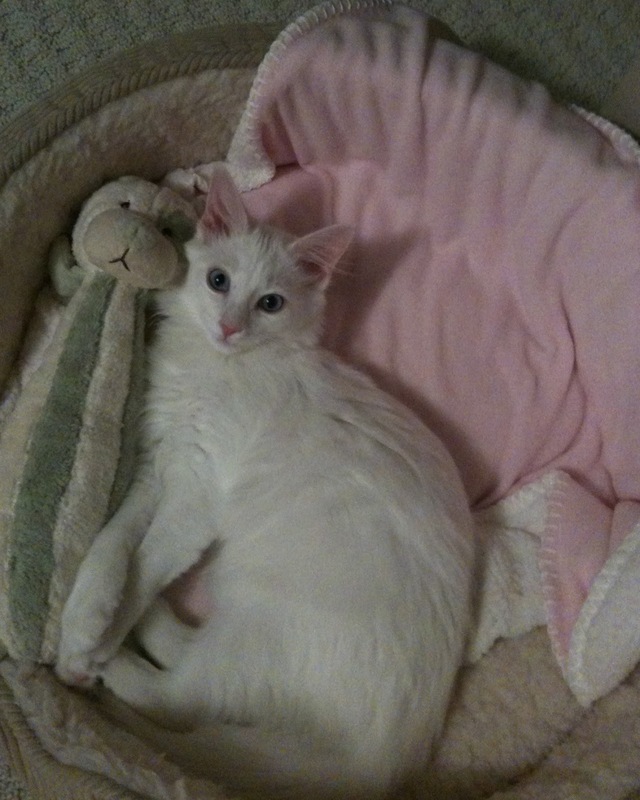 Deaf cats fall squarely under “less adoptable.” But why? I think in part it's a concern over excessive medical bills. But deafness isn't a disease; it's a physiological condition and, unless complicated by infection, should not require medical care. 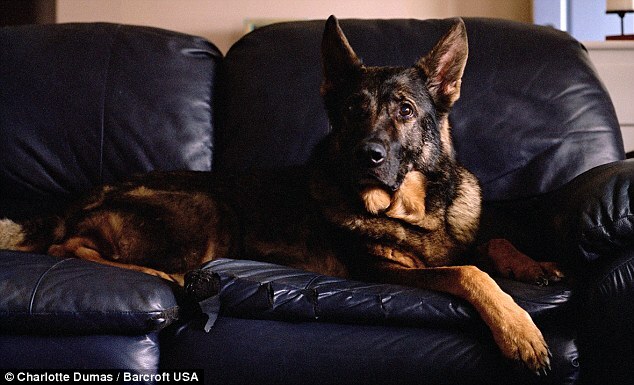 In Maxie's case, one ear is malformed and his eardrum is hanging partially attached and as thin as tissue paper. Nothing we can do about it – he was born that way. Another reason might be fear of the unknown or discomfort around an animal that is 'different.' Perhaps they fear such a pet would be less responsive, but that's not the case. With the loss of one sense, the others become more highly developed. How does one treat a deaf cat? The answer: same as any other – with a few very important exceptions. First and foremost, a deaf cat should never be let outside. With one of their most important defense mechanisms gone, deaf cats are at greater risk. 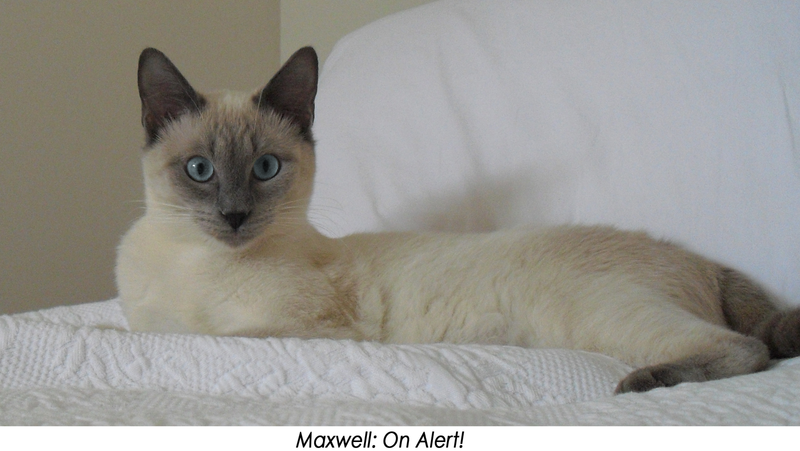 Second, a deaf cat is easily startled. So when you approach – especially when sleeping – be sure to create a vibration by tapping on a surface or create motion by sitting a short distance away on a sofa or bed. Such movement will give him fair warning that someone is near. 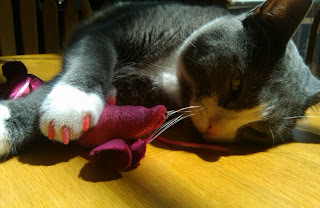 Third, never hit a deaf cat (not even a light bop on the nose in reprimand). Since they can't hear, they can't distinguish between a stern tone of voice and a loving one. All they will come to know is that human hands hit cats, so they'll associate them with painful, unpleasant things. Instead, use hand signals or facial expressions to reinforce your training. Max is exceptionally trusting and innocent, and I'm more protective of him than I am our other two. He is such a joy, has so much love to give, that I cannot imagine life without him. This is post # 4 in a series, read post #3, at www.seabasscat.com. Hello! It's Adopt a Less Adoptable Pet week and unfortunately, one of the categories that's harder to adopt is pairs. Cats thats have lived together a long time are bonded and would not do well without each other. Unfortunately many people fear the extra cost or worry if they have the time for two. We can answer your questions and allay your fears. We're Ronnie and Jelly and we'd like to do a commercial why cat pairs (especially us) make wonderful pets. Pairs are devoted to each other and are already good and close friends. You'd never have to worry if we'd get along together. We have a proven track record of success together. Though cats love humans, y'all are a bit odd and often don't “get” us. Another cat would, and we need understanding as much as food, water and shelter. Not your fault—Mars and Venus thing! We can admire each other's unique abilities. Yours—to get the tops off the tuna cans, and ours—to twist ourselves into furry pretzels to clean our tushies. When you're busy, we entertain each other and don't guilt you into holding or petting us, and let's face it, with kids and a spouse or a demanding job, when aren't you busy? Had a bad day and need something soft and comforting to hold? (No, not a beer can!) You need something soft and warm and with two, you'd have twice the comfort in half the time. Studies prove that petting a cat lowers blood pressure and reduces anxiety. Get our purr motors going and that sound can lull you to sleep. Two do cost a bit more than one, but a single bored cat can overeat so not much difference. We chase each other and get exercise so are often healthier and don't need you for a playmate. When you're scooping out food, how hard is it to scoop enough food for two? Easy peasy! Most vets don't charge for a second office visit for annual exams, just the vaccines which are pretty cheap. We have a special challenge so are looking for a special family. We're 4 and 5 years old, with probably 10 or 12 years left to live. Tons of fun and affection left, but let's face it, many people want cute little kittens. Just wait till they climb the drapes and shred them, or whine incessantly at midnight for attention! Kittens aren't problem free and need lots more of you than older cats. You also don't know what the final personality will be. With us you do - two sweet girls! We have to go home together, so hope you fall for both of us. Looking forward to meeting you. 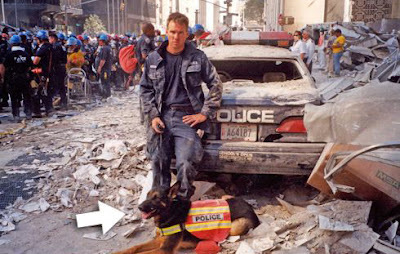 In the aftermath of 9/11 almost 100 Search and Rescue dogs spent day after day tirelessly combing Ground Zero for survivors. Ten years later, just 12 of these heroic canines are still alive. 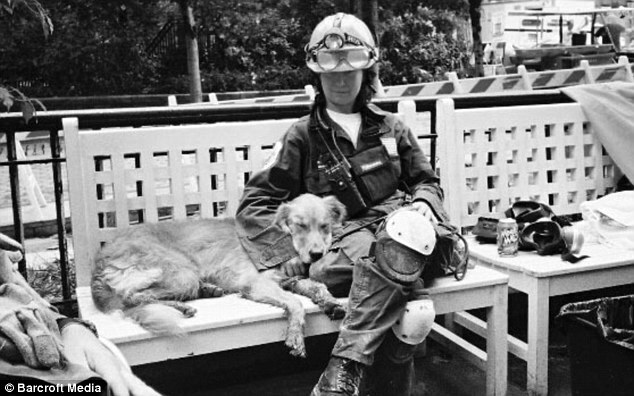 They have been commemorated through the talents of Dutch photographer Charlotte Dumas, and their stories are told in a book entitled "Retrieved." If you're in New York City, you can see these stunning photographs, currently on exhibit at the Julie Saul Gallery, and at the Clic Gallery in NYC on September 29. Mommy found this article about a dog from Halifax, Nova Scotia who went to New York City after the September 11 attacks at the World Trade Center and we thought we'd blog about it since tomorrow marks the tenth anniversary of the awful terrorist attack. Regardless, Trakr was cloned and his 5 'siblings' were delivered to Mr. Symington on June, 2008: Trustt, Solace, Valor, Prodigy and DejaVu. We do give a full round of appawse to Mr. Symington on what he did next though. 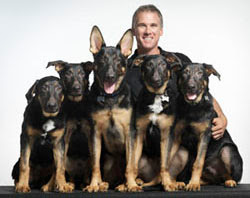 These 5 Trakr clones now make up Team Trakr, an international canine Search and Rescue organization dedicated to continuing the legacy Trakr left behind. oh yes! 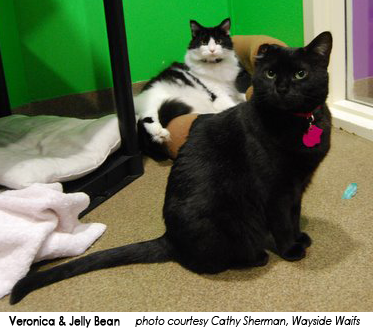 ...out of simply tons of potential adoring families, when they arrived at my Alma Mater, Wayside Waifs. 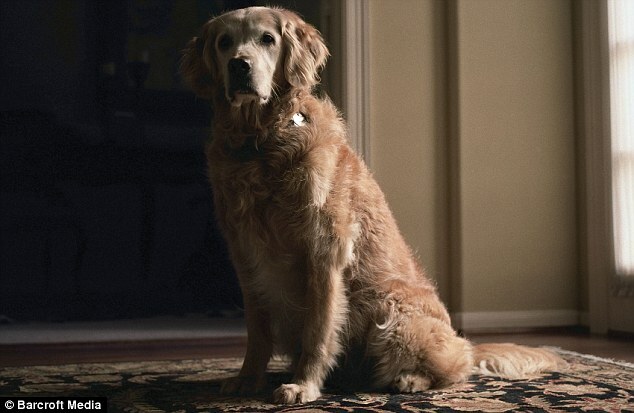 You see, Mother wanted to find out if they were participating in this wonderful promotion that Hallmark, Petfinder and CBS had created in conjunction with their 2009 Hallmark Hall of Fame movie, called "Foster a Lonely Pet for the Holidays." (BRILLIANT, simply BRILLIANT! Okay, so Mother works for Hallmark and I might be a teensy bit prejudiced... *giggle! *) But I digress. They signed up for the Foster a Lonely Pet program, but I knew I had this family in the bag. uhhhhhh.... My turn? *taps microphone with paw* is this thing on? Um, I found Momma a few weeks after she lost Ryker. Papa told her one day that she had been crying herself to sleep for too many nights and her arms were empty. She needed a baby boy again. Momma didn't think she was ready and told the lady she had her doubts but she'd come out the next day anyways. Five months of ear treatments and a surgery later and I can hear - sorta. Enough to hear Momma tell me she loves her baby boy.